Home » Attukal Pongala in Kerala is the Celebration of Women Power! ‘Attukal Pongala’ in Kerala is the Celebration of Women Power! 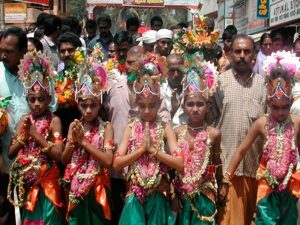 Attukal Pongala is a unique festival. 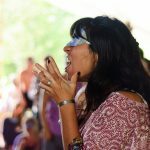 It is a celebration of womanhood and explores our relationship with nature and divinity. Nature bestows upon us its blessings and sustains life on earth. By offering Pongala to the Goddess, devotees express their gratitude towards the supreme power. When offered with utmost devotion, Pongala leads to spiritual awakening in the devotee. 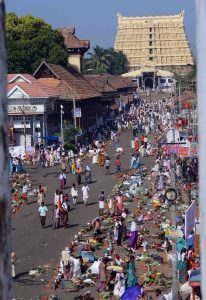 Attukal Pongala is the most famous festival of Kerala celebrated annually at Attukal Bhagavathy Temple in Tiruvananthapuram. It is a 10 days event commencing on the Karthigai star of the Malayalam month of Makaram or Kumbham and closing with the sacrificial offering known as Kuruthitharpanam at night. On the ninth day of the festival, the world famous Attukal Pongala Mahotsavam takes place. The Attukal Bhagavathy Temple is about 2 kilometres away from the Padmanabhaswamy Temple at Thiruvananthapuram. Only women are allowed to offer Pongala. 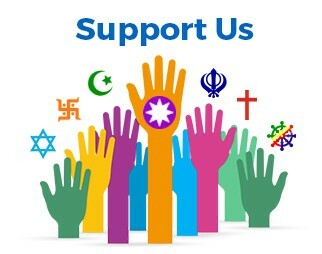 Irrespective of caste, creed and religion, they will start assembling at the temple and on both sides of the roads leading to it. 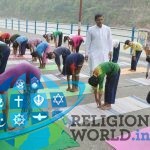 Devotees from all over the country and abroad participate in this ritual. The ten-day festival starts with Kappukettu (kappu means bangles). The idol of the Goddess is adorned with bangles. Pongala is offered on the 9th day. Each year, there is a dramatic increase in the number of devotees. 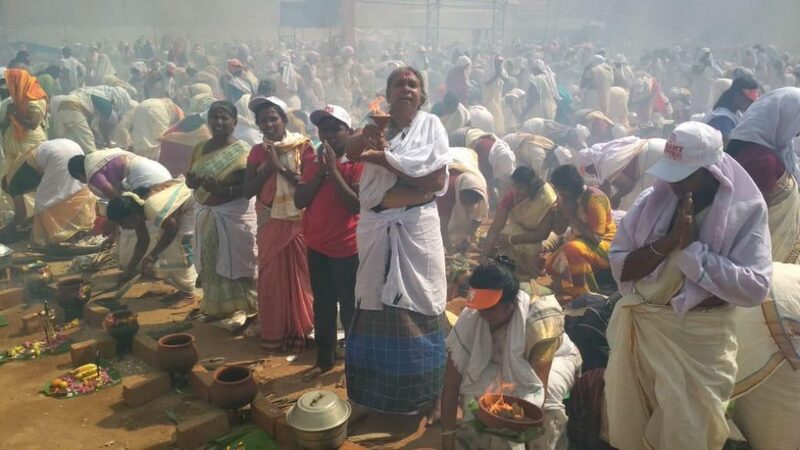 In 2018, 4.7 million women offered Pongala to the Goddess. 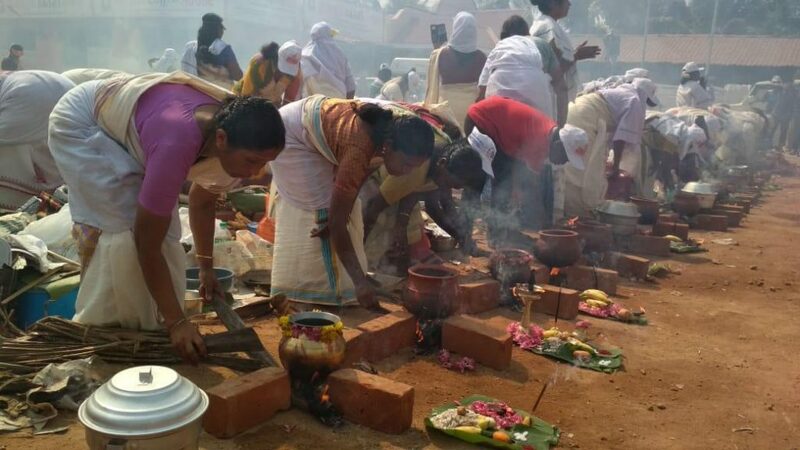 The entire area within the 7-kilometre radius of the temple will be occupied by women offering Pongala. The crowd that gathers in Thiruvananthapuram on this auspicious day will remind us of the famous Kumbhamela Festival of North India. 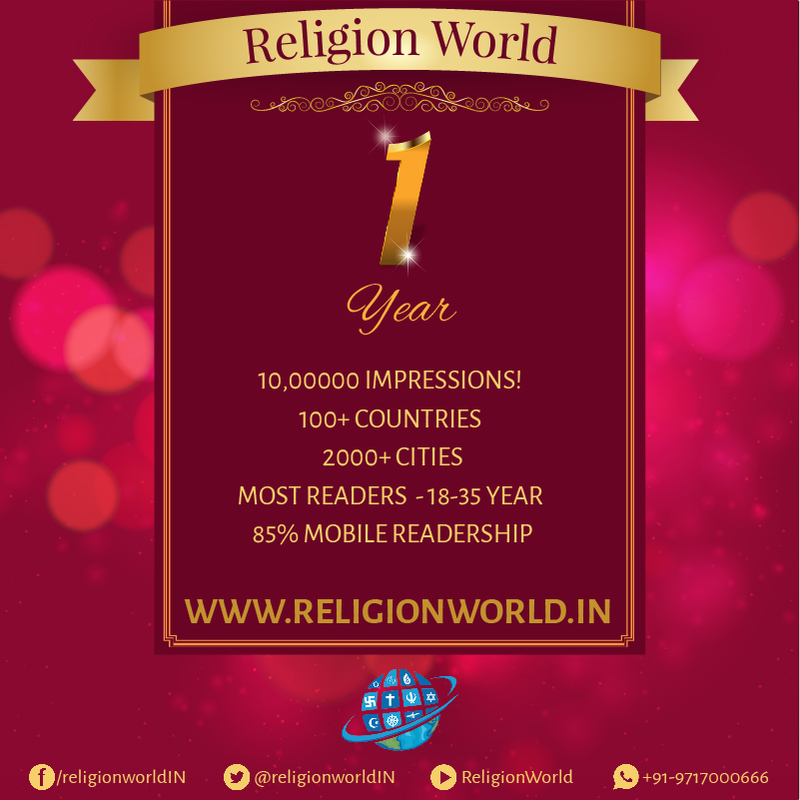 In fact, the Pongala festival recently made it to the Guinness Book of World Records as the largest gathering of women for a religious event. This temple is also known as the Sabarimala of Women because most devotees are women. The Goddess worshipped at this temple is the Supreme Mother – the creator of all things living and non-living. She is the preserver and the destroyer of the universe. On this festival, women come from all parts of the state – even from across the globe, considering the strong presence of non-resident Keralites in the ritual and all walks of life. 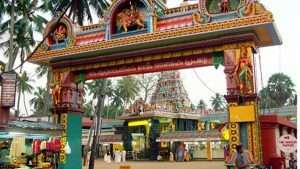 With the women restriction in Sabarimala, Attukal Devi temple is seen as the perfect complementary and is hence called “Women’s Sabarimala”. 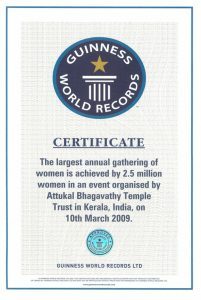 Attukal Pongala is supposedly the largest religious gathering of women in Asia, or even in the whole world. The Attukal Bhagavathy Temple is an ancient one. Some stories have linked the Goddess to Kannaki. Kannaki (also Kannagi) is the central character of the Tamil Epic Chilappathikaram (also Silapathikaram) believed to have been written between 100-300 CE by the Tamil poet and sage Ilanko Adikal. Kannaki, a pious woman, lived in Madurai with her husband Kovalan. She was a chaste woman devoted to her huband. Kovalan, however, fell in love with a dancer named Madhavi and spent his fortune on her. Within no time he lost all of his wealth. Kovalan realized his mistake and eventually returned to his uncomplaining wife Kannaki. Kovalan tried to recoup his fortune by engaging in trade. To raise initial capital he tried to sell one of the precious anklets of Kannaki. Meanwhile, the king’s soldiers were searching for the stolen anklet of the queen. When a penniless Kovalan tried to sell a precious anklet, he aroused suspicions. The jeweller whom he approached accused him of stealing the anklets of the queen. Kovalan was taken to the king’s court and the king beheaded him without trial. Kannaki became furious when she learned that her husband had been killed. She set out to prove her husband’s innocence. She stormed into the king’s court and broke open the anklet seized from her husband. It contained rubies; the queen’s stolen anklet contained pearls. When the King realized his mistake, he killed himself. He couldn’t come to terms with the fact that he had failed to deliver justice. Kannaki, still furious with anger and sorrow, pulled her left breast out, surveyed the city thrice and flung it on the street. She uttered her curse and the fire in her eyes burnt the city of Madurai. 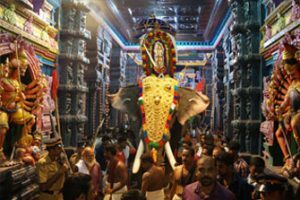 She calmed down at the request of Goddess Meenakshi, the presiding deity of Madurai. In many parts of South India, Kannaki is worshipped as a Goddess. She is the epitome of chastity and its power. 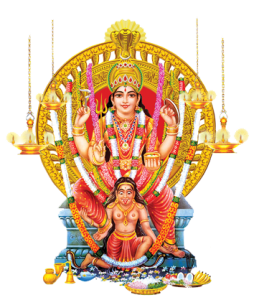 Kannaki is thought to be the incarnation of Goddess Parvathi. After destroying Madurai, Kannaki left the city and reached Kerala. On the way to Kodungallor where she attained Samadhi a few days later, she took a short rest at Attukal. There she met the patriarch of a famous family and requested his help to cross the river. Her beauty and grace convinced the old man that she was no ordinary woman. He happily helped her to cross the river and invited her to his family; however, she disappeared. That night, he again saw her in his dream. She told him that he should build an abode for her in the nearby Kavu (a grove where wild animals and reptiles like snakes are allowed to live undisturbed). As per her wishes, he built a temple in the Kavu. 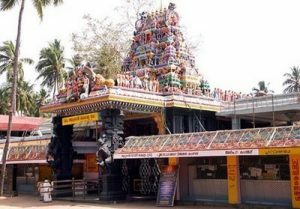 Eventually, this temple came to be known as the Attukal Bhagavathy Temple. Today millions seek the blessings of Attukalamma. Pongala in Malayalam literally means ‘boiling over’. It refers to the act of making payasam or some other sweets as the god’s offering. Though Pongala is offered in almost all temples, none is as grandiose as Attukal Pongala is. 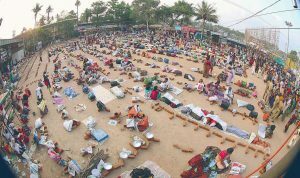 Pongala is conducted in the open air. Preparing the fire place, three stones (three blocks of bricks) are placed at a convenient location. 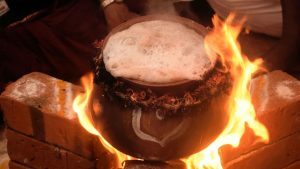 Dried wood or dried parts of coconut leaves are used for making fire and a pot is placed over the fireplace in which payasam and other sweets are prepared. Rice cooked with banana and coconut; rice cooked in jaggery, generous amounts of ghee and handful of coconut, garnished with raisins and cashew nuts; rice powder and green dal powder blended with coconut and jaggery served as steamed mounds of Manda puttu; mixture of rice powder and jaggery steamed in aromatic leaves of vayana….the menu for the Attukal Pongala is a rich palette of flavours and fragrances. While many of the women take a break after the white rice is cooked, some of the devotees roll up their sleeves to prepare more delicacies. Manda puttu, therali appam and aravana are also prepared along with the rice. Though all the devotees do not cook all the delicacies some do. 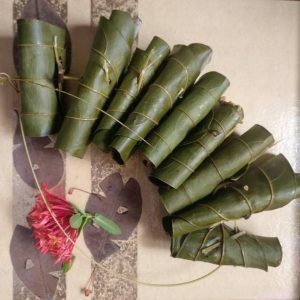 All the preparations are made of rice in different forms – Manda puttu has coarsely-ground green gram as well, it is made with powdered rice, coconut, jaggery and cardamom powder, shaped into balls and steamed, while therali appam is a delight that is steamed in aromatic vayana leaves. A culmination of 10 day-long festivities in the temple, Attukal Pongala is held on the 10th day. Interestingly, one has to go to the temple a couple of days in advance and stay there to ‘book’ a fireplace in the temple premises. Only the most die-hard of the devotees manage to get that. 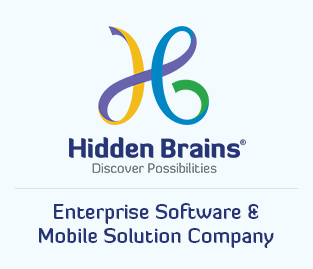 The rest of them have to satisfy with a comfortable point on the streets of Thiruvananthapuram city – in front of houses, shops, government offices or even at bus stops. On the festival morning, the city streets are filled with fireplaces and bricks. The devotees bring the ingredients for making the offering. Pongala is prepared out of rice, coconut gratings, jaggery, sugar, banana, dry grapes, cashew nuts, honey, ghee, and cardamom. The Pongala starts from the time when the first fireplace is lighted by the temple priest. Smoke fills the city air. There are celebrities in the Pongala and there are ordinary women. There are the young and the old. There are even some foreigners offering the Pongala. Everybody makes payasam. Some make multiple types of payasam. Some also make appams (cakes) using different types of leaves. The Pongala will conclude sometime in the afternoon when the priest comes. And finally, devotees fold their hands and offer what they have made to the god in the ecstatic culmination of the ritual. Attukal Pongala Kuthiyottam is a unique ritual performed during the festival. The participants are boys under the age of 13. They are the soldiers of the Goddess. To take part in Kuthiyottam, they have to observe penance for 7 days. The last controversy surrounded this ritual as a case registered against the ritual under the Kerala State Commission for Protection of Child Rights registered a Suo-motu case.